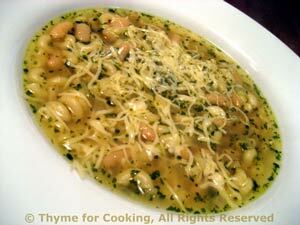 Cannellini and Pasta Soup, Thyme for Cooking easy, healthy recipes. This is what I call a pantry soup: easily put together from pantry staples. This is a first course. For a light lunch, add more pasta and beans. Roughly chop onion and sauté in oil until tender. Add chicken stock and heat to boiling. Add pasta and cook, partially covered, until pasta is tender. Open, drain and rinse beans. Add beans, parsley to soup and heat through. Divide into 2 serving bowls, sprinkle with cheese and serve.